Thank you for your interest in sponsoring the Mercer Island Band Program! The Mercer Island Band Program prides itself on helping students in grades 5-12 achieve a lifelong passion for music and a dedication to developing teamwork, service, and a strong sense of community. The program has been growing steadily over the years, thanks in large part to the cooperative spirit and regular communication between the band directors, the Band Boosters, and the families in our community. Your sponsorship helps us procure the funds necessary for scholarships, teacher development and all that is needed to make this program the “Pride of the Island” and the region. Sponsorship is an excellent way to gain exposure to a wide audience and increase the visibility of your business in the community and beyond. Are you ready to become a member of our band family and march with us? If you are interested in becoming a sponsor of the band program, please contact info@misbb.org. Print logo recognition – We print and distribute programs and brochures for numerous concerts and events throughout the year. As a sponsor, your logo will be prominently displayed in this material. 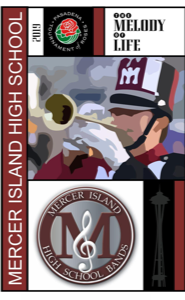 Online logo display and links – Mercer Island Schools Band Boosters (MISBB) website is THE main portal for our communication to current and alumni band families year-round. Your sponsorship logos are prominently displayed on the site and linked to your website. Annual Band Together Gala and Auction – Our ever-popular annual auction guide/program will include your business logo. Callouts during the program call attention to the sponsor page of the program. Want to sponsor a single event? No Problem! If you are interested in a sponsorship opportunity, please email us at info@misbb.org and Thank You! Mercer Island Schools Band Boosters is a 501(c)(3) organization created to actively support, promote and encourage the band programs of the Mercer Island School District. Our business sponsors are important contributors to the Mercer Island Schools Band Programs. Their continued and ongoing support is incredible. Please support our business sponsors by patronizing their services when you can. 2018-2019 MISBB Sponsor – Carrie York, DDS.